A hotel room in France is where Ian Wright’s Arsenal career ended. The 1998 World Cup had just concluded with Glenn Hoddle’s England sent packing after David Batty’s missed penalty. Football was coming home with another tournament tragedy under its belt. England’s toothless Lions had grown used to failure, but this one felt particularly flaccid. The country had been on a high, riding the crest of a Britpop and New Labour wave. The future – and the football – was bright. Arsenal were the double winners, an orchestra of savants giving summary instruction, with the glory captured in crackling technicolour by the assembled Sky cameras. Shuffled without fuss into the next room, Wright would sign a contract with Harry Redknapp’s East London troupe. In the space of a half an hour, a legend had been written out of his club’s history. The manner of his exit may seem harsh. For a man hewn from adversity, however, it was just the latest setback.Thirty-three years before that day, Ian Edward Wright was born on an estate in south-east London. The son of Jamaican immigrants, football offered an escape from a turbulent home life, and the young Wright would play all day with his friends, including when he was supposed to be at school. Eventually he stopped going to class altogether, earning a job as a labourer and leaving home when he was just 14. Four years later, he spent a week in Chelmsford prison for motoring offences, a transformative experience that would resolve him to a life on the straight and narrow. By now, football had become a distant memory. A number of dashed junior trials had dented Wright’s confidence, hidebound youth coaches unimpressed with his impish quality. He was told and believed that he wasn’t good enough, absolving dreams of a professional career in favour of providing for his two young children. Matches in the Sunday League for St.nPaul’s and Ten-em-bee were merely a distraction, until a few appearances for Greenwich Borough piqued the interest of Crystal Palace scout Peter Prentice. Wright was signed on a short-term trial but his performances soon convinced Steve Coppell into a permanent contract. Three months before his 22nd birthday, here was, at last, a chance at a professional career. Wright took the opportunity with aplomb, scoring nine goals off the bench to become the Eagles’ second-highest goalscorer that season. His quality was noted by Palace fans and the media alike, his devastating impact deigning him with the nickname ‘Super Sub’. The following year saw the arrival of Mark Bright, an established player who would influence Wright profoundly on and off the pitch. Together they formed an insatiable partnership, their goals firing Palace into the First Division in 1989. In a simmering six-year spell, Wright would score over a hundred goals on the way to an appearance in the FA Cup final in 1990. Palace fans need no reminding of his performance that day, where his late strikes brought silverware to within a whisper of the Selhurst Park trophy cabinet. Wright’s scintillating form would eventually see him called up to the national team, and after becoming Palace’s greatest goalscorer in the post-war era, a big move was inevitable. Arsenal pounced in the summer of 1991, George Graham signing him for a club-record fee. Before scandal brought an early end to his tenure, Graham was a mammoth figure at Highbury, delivering the league title on two occasions. Wright had tormented the Gunners defence as an Eagles player, and his signing gave an added edge to a frontline already embarrassed by Alan Smith and Kevin Campbell. Quite simply, he was a revelation. North London had grown accustomed to stout defensive performances, where organisation and attrition were efficient to win results. Wright was an injection of pure energy, a chimaera of restless brio whose ability to score from anywhere brought beautiful chaos to the Arsenal attack. A hat-trick on his league debut against Southampton set the tone, as Wright went on to win the Golden Boot in his first season, pinching it on the last day from Gary Lineker. Fans who had questioned the transfer were now united as they sang the familiar rejoinder from the stands, “Ian Wright Wright Wright”. 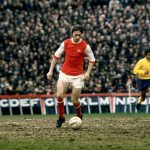 More than the goals, more than the exuberant smile plastered across his face during every game, what made Wright most admired by the Arsenal fans was his commitment. Here was a player with the mentality of a Sunday league journeyman but the ability of a Premier League superstar. Here was a man who knew what it meant to play for an institution but who imbued the joy of a kickabout with your mates. Under George Graham’s caustic command, Arsenal would keep on winning. 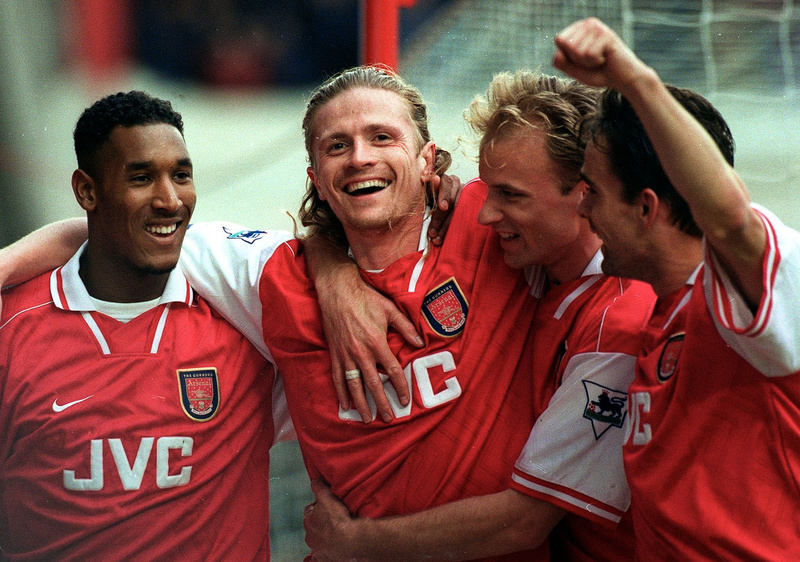 Wright became irreplaceable in the Arsenal attack as they went on to secure a domestic cup double in 1993 and a sensational Cup Winners’ Cup against Parma the year after. Despite falling at the same hurdle against Nayim’s Zarazoga a year later, Wright had again led the charge, his reputation as one of Europe’s most feared marksmen secured after he netted in every round. While things flourished for his club, the story for the national team was less euphoric. After making his debut against Cameroon in 1991, Wright was passed over by Graham Taylor for Euro 92, a clash of personalities denying a world-class talent a fitting stage. England failed to qualify for the World Cup two years later, before Terry Venables again overlooked the Arsenal striker in favour of a young Alan Shearer. Well into his 30s, Wright would be given a reprieve and included in the squad for the 1998 World Cup in France, before an injury in the final warm-up game against Morocco curtailed his involvement. Back in north London, however, things were rosy. George Graham was sacked in 1995 and Arsenal turned to another febrile Scot as his successor. Whilst the club’s position improved under former Bolton boss Bruce Rioch, the morale of the players evaporated under his grating and dictatorial method. Wright in particular found the regime tiresome, even submitting a transfer request to the club before it was summarily rejected. By the beginning of the 1996-97 season, change was needed. 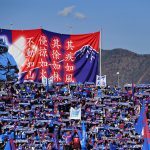 A little-known manager in Japan had been courting the attention of Arsenal executive David Dein, and the time had come to make a move. Arsène Wenger had come closer than anybody to toppling Bernard Tapie’s Marseille, before a match-fixing scandal left him jaded with the European game. Nagoya Grampus Eight was an opportunity to experience another way of life and a sporting culture free from the vagaries of corruption and undue influence. Dein, however, had maintained contact with the man he first met at an Arsenal game in 1989. 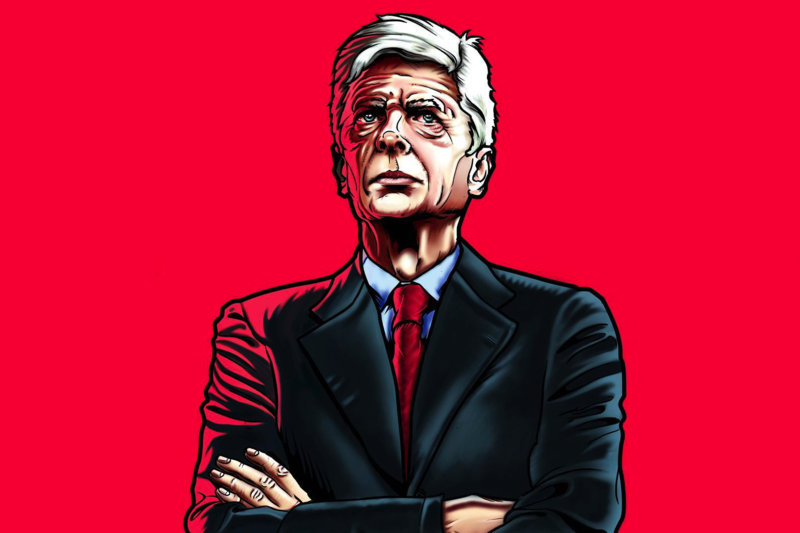 “Treating his players like adults was really what was at the heart of what came to be called the Wenger Revolution,” Wright recalls in his autobiography. As well as being given more freedom to improvise on the pitch, Wenger’s holistic approach to training and nutrition cultivated immediate results. A domestic double was the reward for a team at the cutting edge of a new, modern footballing style, but the real clarion call had arrived a year earlier in a service station just off the M25. 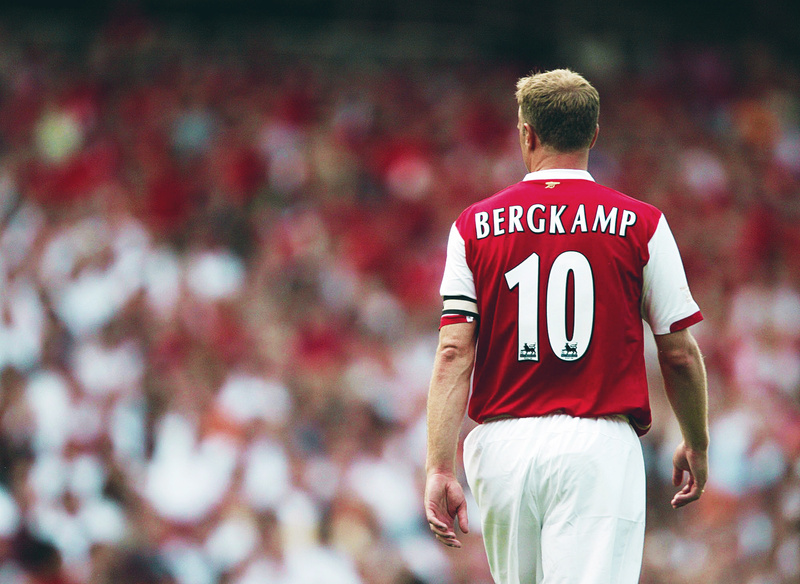 After a difficult few years in Italy, Dennis Bergkamp had just signed a contract to become Arsenal’s record transfer. On his way back to the airport, he stopped for petrol only to he distracted by the noise from another car pulling into the forecourt. Wright and Bergkamp looked at each other with bemusement, before embracing like old friends. Together, they would jump-start Wenger’s footballing enlightenment, the Dutchman’s clinical vision dovetailing finely with Wright’s trenchant movement. Arsenal would finish third in the Frenchman’s first season at the helm, an intriguing prelude to the glory that would follow the next year. On 13 September 1997, Elton John released his famous single Candle in the Wind, in memory of Princess Diana. On the other side of the world, 15,000 people attended Mother Teresa’s funeral in Calcutta. For Arsenal fans, however, something even more momentous occurred on that day. Cliff Bastin had been the star of Arsenal’s incredible team in the 1930s, and his 178 goals had made him the club’s all-time top scorer. 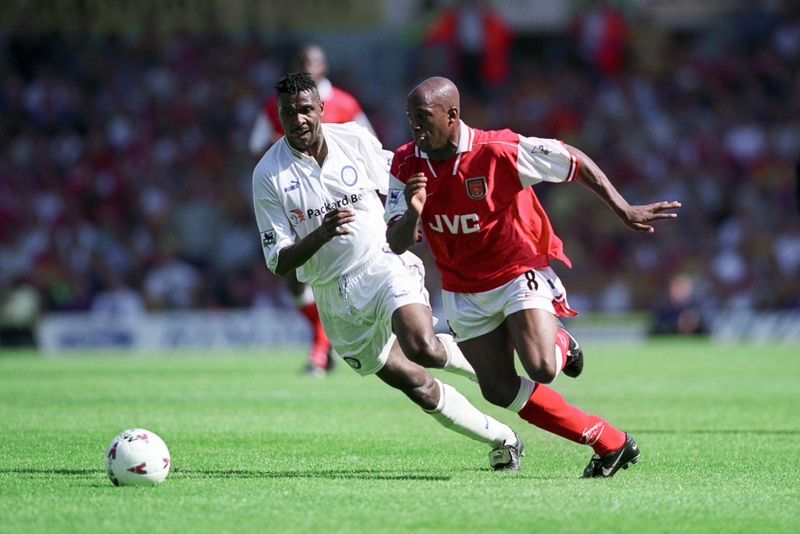 After 58 years, Ian Wright lined up against Bolton Wanderers knowing he was on the verge of history. Perhaps he knew it too well, revealing a vest emblazoned with ‘179. Just Done It’ after dispatching Bergkamp’s laser-like through ball on 20 minutes. The problem, of course, was that he had only matched Bastin’s incredible record. No matter. Five minutes later, Wright pounced on a loose ball in the Bolton box to poke home Arsenal’s third and his 179th. Lifting his shirt over his head, he ran the length of the pitch before being surrounded by his team-mates, as worshipping applause rained down from the sun-drenched stands. The next year, Wenger would lead the club to a famous double. For the first time in six top-scoring campaigns, however, Wright’s name was not the one on everybody’s lips A quiet French teenager by the name of Nicolas Anelka had been signed from Paris Saint-Germain and his frightening displays had lit up Arsenal’s triumph. Wright, for the most part, could only watch as his position was usurped, and it was no surprise when his transfer to West Ham went through without a hitch in the summer of ’98. After an inauspicious year in East London that included a sojourn at Nottingham Forest, Wright travelled north of the border to join John Barnes and Kenny Dalglish’s infamous regime at Celtic. For many, the experience of playing for the Old Firm would be a career highlight, but for Wright it felt more like a nadir. The atmosphere of violence and sectarian hatred left a sour taste, made all the more unpalatable by a feeling that he was past his prime. Let go by Celtic, Wright signed a short-term deal with Burnley, helping the Lancastrians secure First Division status with a number of crucial strikes. He retired in 2000 with an astounding 313 professional goals. During his playing career, Wright’s bristling warmth had made him naturally likeable. Still, his metamorphosis into primetime television personality brought titters and raised eyebrows in the footballing fraternity. The doubters would soon be quelched, with the BBC building a flagship entertainment programmed around him entitled Friday Night’s All Wright. His ingratiating and affable style would see him secure memorable interviews with the likes of Denzel Washington, Lionel Richie and Elton John. Like the footballer, the show was an instant hit. Despite his success under the studio lights, however, Wright struggled to adapt to life after football. With his appetite for celebrity and light entertainment waning, he gravitated back to the game and now appears regularly as one of the more colourful and insightful pundits for the sport. For all the trophies and goals, a turgid sense of ‘what if’ surrounds Wright’s career. If those early scouts and coaches had been less blinkered, if he hadn’t fallen foul of politicking national team managers, and if Wenger had arrived 10 years earlier, there’s no reason why he couldn’t have enjoyed a national career to rival that of any England great. Wright’s failure to deliver in a national shirt speaks more, though, about institutional problems within the game than any lack of talent on his part. His ability and his influence may have deserved more, but Arsenal and Crystal Palace fans don’t care. They had him and they’ll always have him.